Manager Craig Hignett puts Hartlepool United's recent National League revival down to one thing - hard work. 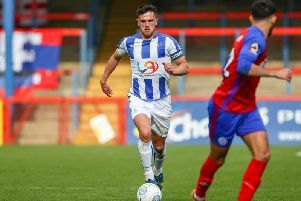 Pools beat Football League automatic promotion hopefuls Wrexham to the sword at the Super 6 Stadium, and did so at a canter as Josh Hawkes' ninth goal of the season proved the difference on the day. And Hignett puts Pools' recent run - which has seen them lose just twice in 10 games - down the graft on and off the park. “It was a proper team performance. Everyone played the part," he said, reflecting back on Pools' Dragons slaying. "We looked dangerous and organised and the only disappointment was we didn’t take the breakaways we had later on. "I was more comfortable in the performance and display as we went along." Hignett continued: "It’s down to hard work and we have changed the way we play, they’ve all took it on board and have confidence. Results breed confidence and we have only lost two in ten. We are still a work in progress, but we can see the football we are moving towards. “I’m really pleased for everyone here. “The balance was good, and under pressure against a team going for promotion we coped with all they had comfortably." Hignett paid particular attention to giving credit to the crowd - often a recipient of stick from within the camp this season. “It was enjoyable, the crowd were good," he said. "The atmosphere was fantastic and it helps the lads, hopefully we can keep them coming and enjoying it. "Everyone, crowd, players, club has all pulled together of late. Different class."